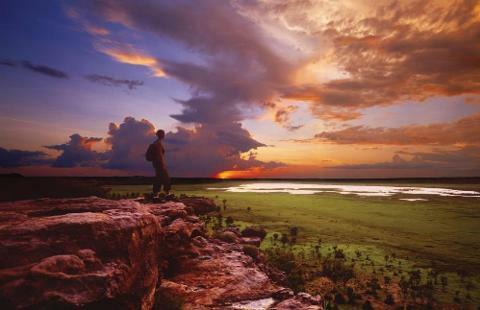 Depart Darwin and travel along the Arnhem Highway into Kakadu National Park. 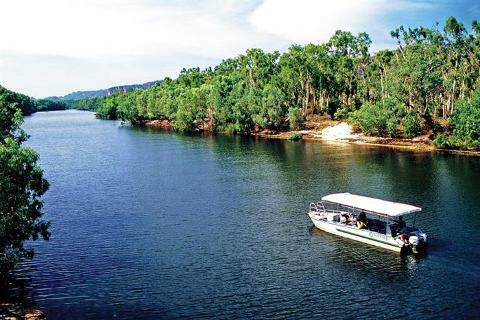 Visit Warradjan Cultural Centre then join your local guide on a cruise of Yellow Water Billabong. Search for saltwater crocodiles and the colourful range of birdlife for which this region is renowned. After lunch, stop at Nourlangie, where your Driver Guide will take you on a walk to view the rock art galleries. 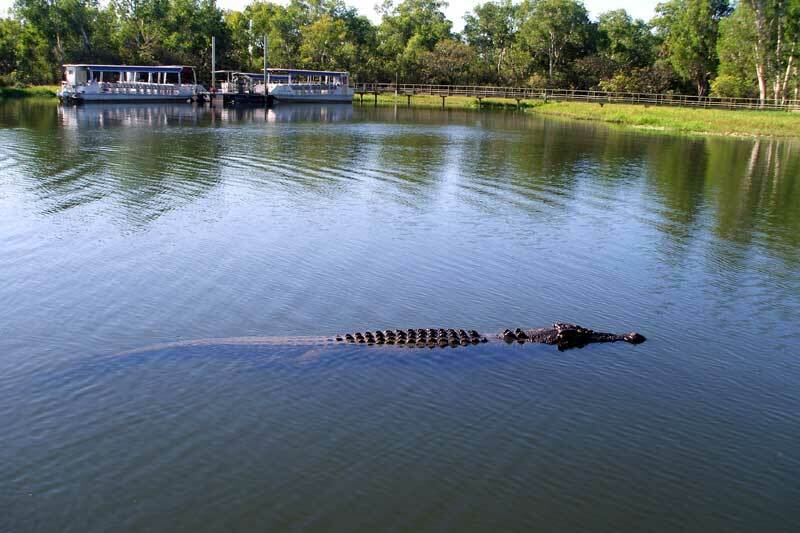 Hotel: Mercure Kakadu Crocodile Hotel (Superior), Kakadu, 3 nights. This morning travel by 4WD vehicle into Arnhem Land and the Mikinj Valley. The spectacular scenery includes sandstone outcrops, escarpments, forests, floodplains and billabongs. You’ll visit places inaccessible to most, including ancient rock art sites. Learn about traditional land ownership, bush skills, hunting, food gathering and bush tucker preparation. Travel by 4WD to Jim Jim Falls. 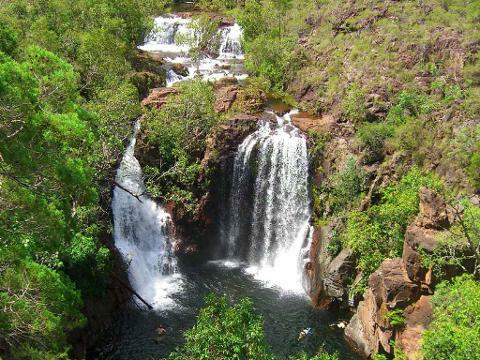 Take a 900 metre bushwalk to the Jim Jim Falls plunge pool, where there is time for a swim. After lunch, board boats to cruise up the first part of the Twin Falls gorge. There is a 45 minute walk over slippery rocks with sand and along rock ledges. Relax and enjoy spectacular scenery at the base of the falls. Today’s touring is suitable for people with a good level of fitness. This morning stop at Ubirr for a short walk to view Aboriginal rock art. Later, join the Guluyambi Cultural Cruise along the East Alligator River. An Aboriginal guide will provide an insight into their culture, including local mythology, the river’s abundant food chain, traditional uses for many plants and animals as well as bush survival skills. Disembark on the Arnhem Land side of the river to see a display of traditional hunting and gathering implements before heading back downstream. Visit the Bowali Visitor Centre before returning to Darwin, where your short break concludes this evening. As this Short Break concludes at 7.30pm, you may like to pre-book accommodation for tonight. Note: This itinerary is valid for travel from 1 April 2016. Minimum child age is 8 years. Good level of fitness is required. Minimum child age 8 years. Small amount of walking including a 10-15 minute walk on uneven ground with a gradual climb to the viewing point. There is wheelchair access, however, this is on uneven ground and is accessible for only a small part of the walk and must have a carer to assist. Day 2 & 3 touring is by small vehicle. Guests must have a reasonable level of fitness and agile on their feet to do the walks to Jim Jim Falls plunge pool and the base of Twin Falls. Suitable footwear must be worn.